In spite of (or perhaps because of) another very hot, dry summer here, my suburban backyard is a small refuge for a variety of insects, birds, and reptiles. Among the largest of the reptiles I’ve seen recently is the Texas Spiny Lizard (Sceloporus olivaceus), which is about seven or eight inches in length, including the tail. A handsome and spiky dragonesque creature, the Texas Spiny Lizard is nevertheless quite shy, and is usually heard, but not seen, skittering around after insects in the leaf litter under the Eastern Cottonwood (Populus deltoides). A very few times I’ve seen this native lizard sunning itself on a rock near the compost bin, or splashing through the birdbath; most of the time, its presence is known only by the noise it makes in the dry leaves, and by a fleeting glimpse of a long striped tail. 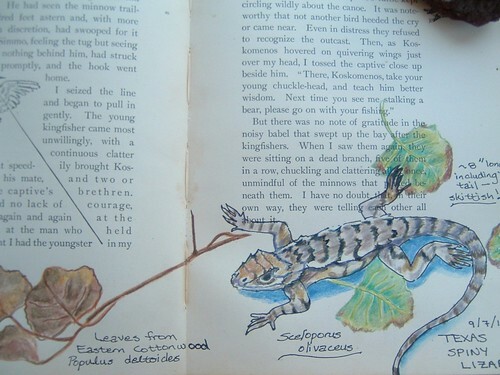 A few of you may remember that I’m fond of defacing altering books with paint, colored pencils, felt-tip pens, and my scribblings on wildlife. My primary art journal is currently locked up in a display cabinet at the university, as part of an exhibit on a neuroanatomy elective that a colleague and I “supervised” (two second-year medical students designed and implemented the course) this spring, so I returned to the altered book for the drawing below. The book is not valuable, and I bought it second-hand in London years ago; it’s filled with a lot of disagreeable “great white hunter” adventures, one of which I painted over completely, except for phrases including “owl” or “owls.” The altered page below is part of a chapter in which the author is trying to shoot a bear, which is warned off by the rattling call of a Belted Kingfisher. The author goes on to describe accidentally hooking a juvenile kingfisher, and then removing the hook from the unfortunate bird. This entry was posted in art journals, urban wildlife and tagged compost, reptiles, Texas_wildlife. Bookmark the permalink. Beautiful drawings as usual, Kristi. I think there’s only one species of lizard that lives hereabouts (the Five-Lined Skink, Plestiodon fasciatus), but I’ve never seen one. Cute, but not nearly as dramatically handsome as your spiny friends. There are also Green Anoles here, and Mediterranean Geckos – in fact one (at least) of the latter is currently on the loose inside my house. I’ve tried to catch it to release outdoors, but I’m not quick enough. Oh well. 😉 I’ve seen whiptail lizards in the backyard as well, but haven’t been able to identify the species yet. The lizard I definitely DO NOT WANT in the backyard is the venomous Gila Monster. Fortunately they’re relatively uncommon, at least in town. Thanks, Richard, rpg, and cromercrox! I’ve missed being part of the OT community, reading and contributing here. It was a self-imposed exile, largely because I was feeling overwhelmed by the task of developing a module in our new medical school curriculum. It’s still a daunting task, but I feel much better about the direction and organization of our module, thanks to my clinician colleagues and to a few successful educational experiments this spring. Anyway, I’m ready to start writing again, with art journal posts, maybe a few posts on our module development process (and how it turns out … first run is next summer! ), and of course posts on cities and environmental issues. Yay, Kristi art! Welcome back!